You may have been wondering where I have been. Well, actually I’m guessing you haven’t. Let’s be honest, this is a very minor blog, which is why I haven’t updates in ages, although I have still been doing my work for MyM and Anime UK News. My anime writing for On The Box however dried up, and I had to put “The Beginner’s Guide to Anime” on hold while having to focus on more mainstream British TV coverage. Luckily, during that time more anime is being shown on UK TV, albeit on Viceland, a channel with small viewing figues. The updates stopped mainly due to my work for the British Comedy Guide, covering the Edinburgh Fringe, and because of that everything else got put on hold, and due to the small number of people who visit this blog it didn’t feel much point in updating it. However, I’ve now written a new “Beginner’s Guide”, and as the Winter Olympics are coming up I’ve covered Yuri!!! on Ice. I’m certainly hoping one of the skaters at the games performs to their music. Again, sorry for the lack of updates. I intend to be more active in future. Luckily I got a new computer, meaning everything should be much quicker to do. I have good news (well, at least it is good news for me). Thanks to a request from On The Box they had for some advertising, I’ve been able to continue “The Beginner’s Guide to Anime”. As I already written a piece about the parody series Otaku no Video I decided to repost it on OTB, so now it is officially part of the column. While I may have be not be writing “The Beginner’s Guide to Anime” column for On The Box, I can still write the odd piece. As it is LGBT History Month in the UK, I’ve written a piece about Yuri!!! On Ice for the website. The Beginner’s Guide to Anime, No. 173 – Panda! Go, Panda! First, an apology. Sorry for not updating the blog for a while. I was busy working in the Edinburgh Fringe and it takes up a lot of my time. The last “Begnner’s Guide to Anime” was Hayao Miyazaki’s short film Panda! Go, Panda! It is also the last one I’ll be writing for On The Box as they have stopped to column (it was considered too niche for a mainstream TV website), so from now on the Beginner’s Guide while move to here. The Beginner’s Guide to Anime, No. 172 – Cheer Boys!! 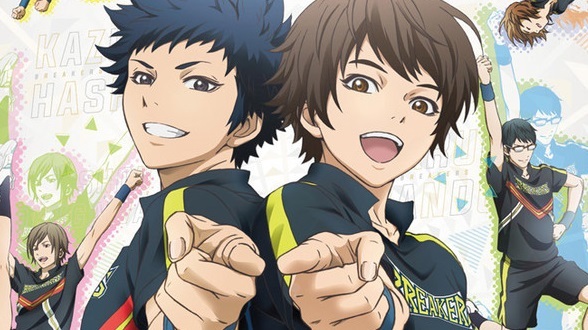 “The Beginner’s Guide to Anime” this week looks at Cheer Boys! !, about an all-male cheerleading team.